The ultimate in tradition- the Njulu basket is found in every home in the central region of Uganda or where a Muganda wife is cooking. 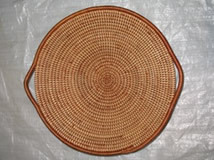 Njulu baskets are given as traditional wedding gifts to the bride so that she can prepare food for her husband. She mashes and presses a parcel of steamed bananas (matoke) in the basket with her hands. She knows that in her tradition no meal is complete without matoke and therefore no woman is complete without the njulu and banana leaf stem basket. 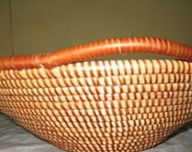 Njulu baskets are very practical as njulu is hard, smooth and very durable. Due to its texture the njulu material does not dye well. 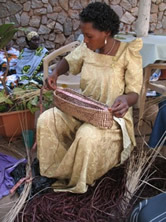 Most of the traditional njulu baskets are not dyed as a result. 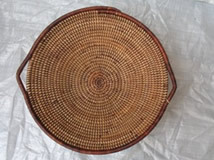 All njulu baskets contain a little double over line somewhere in the plain design which usually looks like a mistake to those with a keen eye. However this glitch has significance amongst the Baganda and cannot be removed from the basket design.